HTV Magazine’s special episode “Homeless in the Heartland” earned the 2014 Robert F. Kennedy Journalism Award for high school broadcasting. The student journalists involved in producing the episode received the award during a ceremony at the Newseum journalism museum in Washington, D.C. May 22. 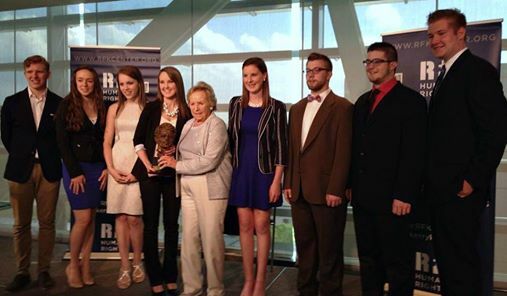 The HTV Magazine team behind “Homeless in the Heartland” received the 2014 RFK Award from Robert F. Kennedy’s widow Ethel Kennedy during the awards ceremony May 22 at the Newseum. The RFK Awards honor those who report on issues reflect the late Robert F. Kennedy’s concerns for human rights, social justice and the power of individual action. The awards are presented annually by the Robert F. Kennedy Center for Justice & Human Rights. The RFK Award is among the most prestigious honors presented for high school journalism students. This is the seventh time the HTV Magazine team has received the RFK Award for high school broadcasting, more than than any other high school TV program in the nation.